(15/P4) TRENTON – The Department of Environmental Protection has partnered with Drew University and the Lake Hopatcong Foundation on the first ever comprehensive GIS survey of docks on state-owned Lake Hopatcong, which is the state’s largest lake, Commissioner Bob Martin announced today. The collected data will aid the DEP in enforcing dock regulations and making decisions on permit requests for the repair and rehabilitation of existing docks, and construction of new docks on Lake Hopatcong, which is a 9-mile-long, 2,500-acre body of water located in Morris and Sussex counties. 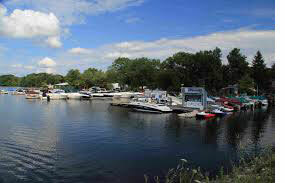 The lake is used for boating, fishing, swimming and other water-related recreational activities. The survey also will assist the DEP’s and the Lake Hopatcong Commission’s newly formed dock committee, which will review dock regulations for potential changes. The new data shows there are 2,183 docks on Lake Hopatcong, and it provides breakdowns of dock lengths and other key facts, such as owner information, lots and blocks, and street addresses. It also provides a breakdown of docks by the four municipalities surrounding Lake Hopatcong -- Hopatcong, Jefferson, Mount Arlington and Roxbury -- and divides them into residential and commercial structures. The survey work was done by Drew University Assistant Professor of Environmental Studies Lisa Jordan and two of her students, Maxwell Dolphin and Daniel Ratyniak. The Lake Hopatcong Foundation coordinated the project under the direction of its grants and project coordinator Donna Macalle-Holly. Lake Hopatcong was originally two smaller adjacent lakes, Great and Little Ponds, which were the headwaters of the Musconetcong River. It was constructed as part of the Morris Canal, a 90 mile waterway that extended from Newark in Essex County, to Phillipsburg in Warren County.